Trademark Check - Is the name already registered? With Trademark Check, you can test whether one of your favorite names has already been registered as a trademark by someone else. This step is crucial: you should never settle on a name without having done a trademark check! If your membership allows you to use the Trademark Check, the cost for this check is already included in your membership. No additional fees! One click on one of your favorite names is enough to start the Trademark Check. After approximately 30 seconds, you will see the results. What the Trademark Check does is identity research, which means that all identical trademarks are shown if they exist. Moreover, you see where and at what date the trademark was registered. You are also provided with information on the classes of goods and services that the trademark is registered to. NameRobot checks US, German and Swiss trademark databases as well as trademarks valid across the European Union and international registrations administered by the International Bureau of WIPO. If you have found a candidate for a name that is good - and has not already been trademarked - you can have it checked thoroughly by your lawyer and then register it as a trademark. 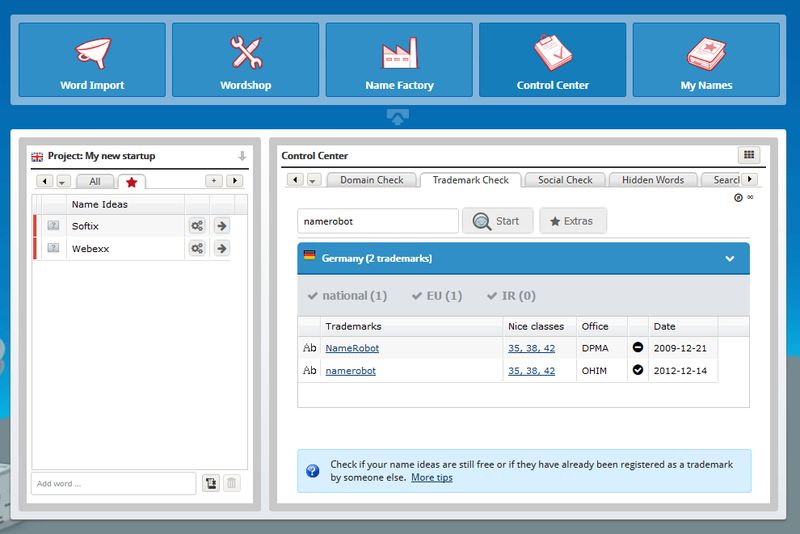 Check the availability of trademark names by region with one click. Go to the Trademark Check in the Control Center right now to test it out! If you don't have a NameRobot account yet, simply register and start looking for a name!